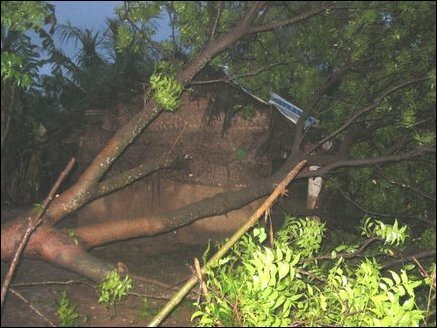 Effects of cyclonic storm Fanoos which passed throught Tamil Nadu and Pondicherry coast was felt in Jaffna district, as hurricane force winds and heavy rains belted Jaffna distric from Friday night leaving thousands displaced in Vadamaradchy north and east. The storm weakened into a deep depression over the southwest Bay of Bengal on Saturday morning, according to weather center in Tamil Nadu. 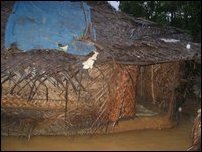 50-60 kmph winds have caused heavy damages to roofs and homes in low lying areas in the district have been flooded. 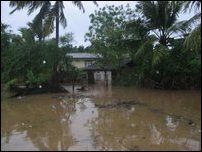 Families affected have sought refuge in nearby buildings and schools, sources in Jaffna said. Several coconut and Palmyrah trees also have been felled by the hurricane force winds, residents said. 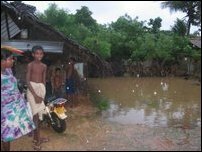 Officials directed by Jaffna Government Agent and volunteers attached to the Tamils Rehabilitation Organization are providing food and other assistance to the displaced families. Heavy rains are expected to continue for another 24-48 hours, weather forecasts said.